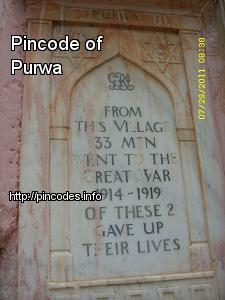 Purwa is a town and a Nagar panchayat in Unnao district in the Indian state of Uttar Pradesh. Purwa is located at 26.47°N 80.78°E﻿ / 26.47; 80.78. There is a white marble plaque in the village which commemorates the contribution of 33 unnamed men from the village, who went to the Great War 1914-1919 and fought on the side of the British imperial forces. With 22 of the 75 districts bearing the brunt of flood fury, the Army's assistance has been sought in around six worst-hit districts, including Gorakhpur and Siddharthnagar, they said.